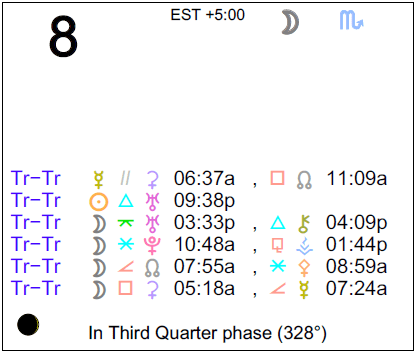 The Sun forms a trine with Uranus today, and this energy serves to detach us just enough to be able to embrace change or to move forward in some way. There can be a nice feeling of looking forward to the future and a desire to make improvements without pressure. 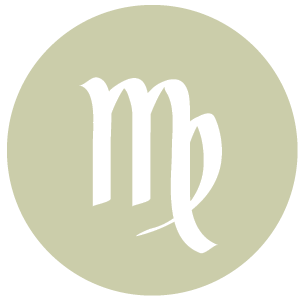 The Moon is in Scorpio all day (until Wednesday, December 9th, at 5:25 PM). The Moon is waning and in its Waning Crescent phase. 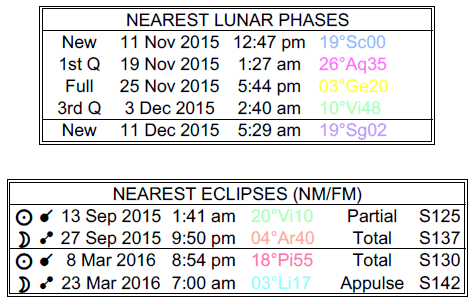 A Last Quarter Moon occurred on the 3rd, and a New Moon will occur on December 11th. A Sun-Uranus trine today stimulates wonderful forward-looking energy, dear Aries. You are likely to want to put something behind you and to look to new horizons now, and your attitude is optimistic. A strong urge to rid yourself of restrictions, particularly in the mind or in your attitude, can motivate you to take charge. You may be excited about new projects or interests or old ones that you are ready to push forward. Look for opportunities to publish, promote, travel, share, and learn. You can be happy to put an old method behind you and embrace a more open or authentic way to express yourself. There can be a desire to enjoy an entirely new adventure of sorts, whether this is in the mind or physical. 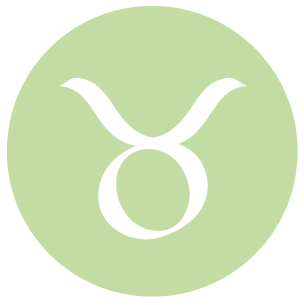 You might enjoy a desire to put a problem behind you today, dear Taurus, related to a relationship or your own emotional state. Embracing change comes more easily to you today than it does on most other days as you are able to detach yourself from some elements of the past. There is readiness when it comes to approaching typically tricky or deeper emotional issues, if only to move past them. There can be a bonus received now, either material or emotional, that seems to come up out of the blue. If you’re in need of a regeneration of sorts, including kicking a bad habit, this is a good time to do so. A pleasing connection can be made today. You can experience a strong emotional need to do something spontaneous or taboo – to break through barriers. Behind the scenes efforts are favored now. 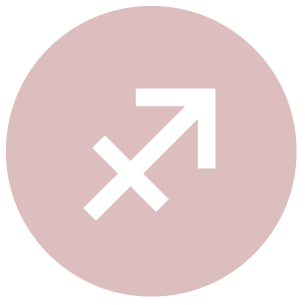 The day brings good energy for connecting with others, dear Gemini, whether it’s a one-on-one situation or a friendship that develops from a friend of a friend or group connection. It’s an excellent time for being around people, networking, pairing up, and following through on recent connections. You are a little more spontaneous than usual, and people around you seem to be open to change and progress as well. Putting your head together with someone, you might come up with a great idea or opportunity that may not occur to you on a regular day. It’s also a good day to socialize and fraternize, join a group or attend a meeting, and otherwise make connections. You may open your eyes to someone who appears more friendly, or someone could see you in a new, more positive light. You’re also less anxious about social situations today. This is another strong day when your ruler, the Moon, forms supportive aspects and you feel freer to be yourself, dear Cancer. Romantic and creative activities are favored. Also today, a Sun-Uranus aspect encourages a healthy desire to improve and make changes, particularly in practical areas. You can come to a new understanding about certain career, health, or financial matters today, or an overview of sorts as to where you are headed or want to head. Goals seem realizable. The desire is to move past problem areas or situations that truly hold you back from realizing your potential. New insights can be experienced now, and should not be ignored. A money-making idea may very well be golden. You might come across a new and innovative method for getting your work done or a way to update technology or methods of doing your business that free you to pursue other opportunities that require your attention. A sense of turning over a new leaf with a health or fitness goal can be with you today. 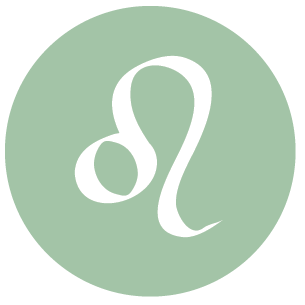 You can experience a desire to put something behind you or pull yourself out of a rut today, dear Leo, and this is especially so on romantic, recreational, and creative levels. This is a good time to break the routine in little or subtle ways – there is no need to force. Small personal triumphs are the goal now, and you might consider opportunities in areas of recreation, hobbies, higher education, travel, or publishing and promotion. You can find that others are agreeing with you or harmonizing in key ways, particularly a partner or significant other. You may be feeling more confident about pursuing a personal interest, creative endeavor, or even a relationship than you have been. There can be an opportunity to learn a new way of thinking through a connection or recreational activity (even an inspiring book or movie) or to inspire someone with your ideas and perspective. 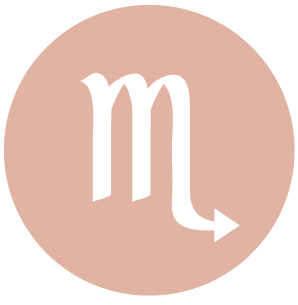 The chance to put something behind you on an emotional level can emerge today, dear Virgo. This can be about a financial or home matter for some of you. This is a time for exploring ways to break out of a rut with family, in your home life, or in terms of your attitude towards how much you are in control of your own world. Allow yourself to enjoy your relationships with others by detaching yourself a little from your fears and insecurities, as good energy is with you for pushing beyond your usual limits and barriers, which are often self-imposed in the first place. There can be cooperation with someone close to you now. Some might enjoy good news on a financial level. This can also be a day when you or someone you love opens up about an intimate matter with nice, liberating results. 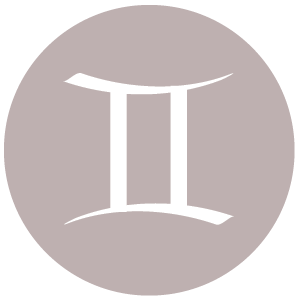 Circumstances are such that it’s clear a relationship needs a fresh approach today, dear Libra, or you begin to see your relationship needs in a brand new way now. You’re approaching life with more spirit and faith, particularly as you interact with others and in your communications. There can be unexpected assistance or kindness, and possibly pleasant surprises, from a neighbor or acquaintance, partner, or close friend. Communications are more open-minded and forward-looking than usual. It’s a good day for reaching out, checking in with others or extending simple gestures that show you care, and learning new things. A new mental interest or project could reach a nice turning point or you might refresh an old project. The attitude today is “out with the old and in with the new” particularly for you as this pertains to relationships, learning, transportation, and communications. 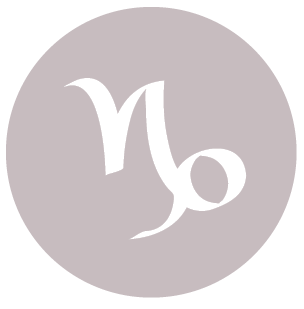 Today brings good energy for getting over things – living in the present and looking forward to the future, rather than dwelling on the past, dear Scorpio. It’s also strong for planning and formulating strategies. Your intuition is serving you well. New insights into your career path, money and resources, or a work project can emerge today that can truly push you forward. You are drawn to new ways or methods for improving your daily life, income, and health now. In fact, alternative healing methods can be a draw now, or you might discover new ideas about approaching your health that liberate you from methods that haven’t been working for you. You certainly need to break out of any ruts that have kept you from thriving. The Moon occupies your sign all day, bringing visibility and an open pipeline to your emotions. Once again, the Moon is finding easy outlets for expression, and you’re in a great position for personal appeal and creative insight. The Sun in your sign is forming a beneficial, supportive aspect to progressive Uranus today, dear Sagittarius, and this can stimulate some nice feelings of moving forward, particularly on creative levels. Others may be noticing you and appreciating your point of view, and they can be drawn to your optimism and ability to detach at appropriate times. You could be feeling freer to be yourself, to express your ideas or your affections, and even to put on a little show with your talents if it so pleases you. Your tastes may seem a little offbeat or different today, and you are also interested in new and different hobbies, pastimes, and recreational activities. It’s a great time to breathe new life into old projects and even relationships, or to pick up a new interest and pursue it with confidence. Don’t ignore the emotional opportunities of the day in the process: good energy is with you for connecting with family. 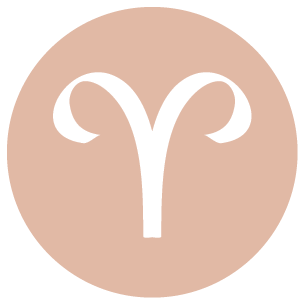 An important change occurs today, and while its benefits may not be clear to you just yet, dear Capricorn, you’re likely to feel rather brave and confident as you sense you’re moving past something. There is more openness to change in the family unit or within your own mind as you are willing to let go of an expectation or a burden that you may have put on yourself. Family matters can thrive with an open mind. You might consider ways to improve your living space. This can be a time for receiving or giving support and help, and it can be gratifying. The key theme of the day is some form of liberation. You need to feel the weight of burdens lift. Look for opportunities to pull yourself out of a rut or to free yourself of an energy-draining habit. 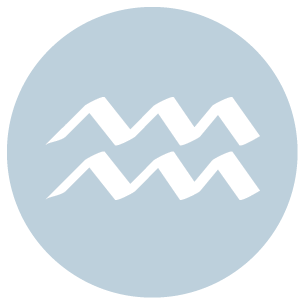 This can be a strong day for communications and relationships in general, dear Aquarius, as your ruler, Uranus, forms a strong, supportive aspect to the Sun, currently a guest in your solar sector of friends, groups, and long-term dreams and goals. You are likely to feel quite confident and optimistic, and possibly excited to share ideas and plans with others. Networking can be beneficial or enjoyable now. You’re in an especially open frame of mind about making changes. There may very well be a new avenue of communication that opens up with someone special today, and agreements might be made or easy interactions with others are featured. There could be good news or encouraging, inspiring conversations. Open the airways, communicate, and encourage others to do so as well. 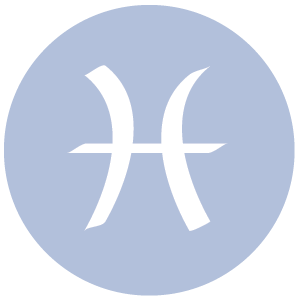 You might enjoy a pleasant surprise now, dear Pisces, related to your work, long-term goals, and finances. Some of you could enjoy a bonus, raise, or some form of recognition for your efforts. Others might come up with a new idea related to business or money-making plans. This is a time when you’re feeling especially open to new ideas and opportunities, possibly acquiring a new item that improves your life, or discovering a method that improves your work or business. Your intuition is strong when it comes to new ideas to make improvements. It’s a good idea to present yourself professionally today, as people can be drawn to your ease with practical affairs and your open-handed, open-minded approach. This is also a fine day for learning and teaching, legal matters, and travel plans. *Remember to read horoscopes for your Ascendant sign and Sun sign. 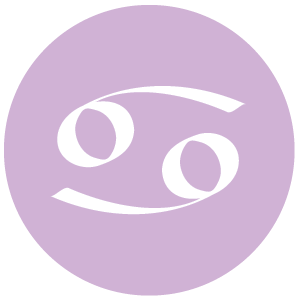 If Your Birthday is December 8th, If Today is Your Birthday full horoscope here. Contemplate the deeper things in life. Avoid unnecessary conflict, but if it’s going to improve your life, go ahead and make waves. Tune in to your intuition. This is a good time for investigations, looking into a matter further, doing research, connecting to others with a shared passion, solving a mystery, and devising a strategy. 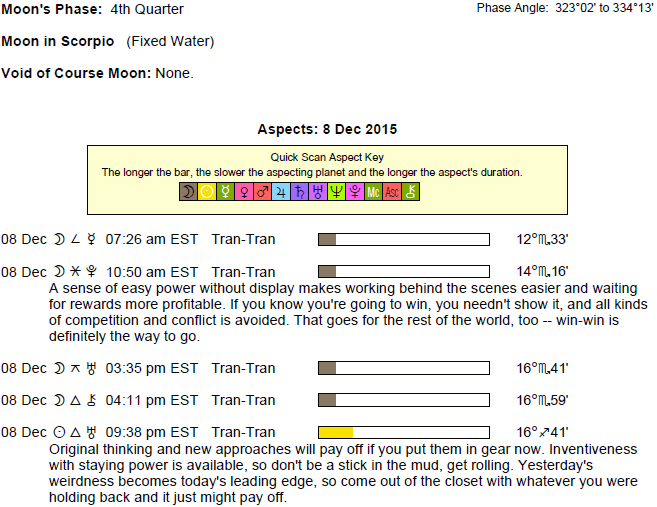 When the Moon in Scorpio is strained, we may take our passions too far. There can be conflicts with loved ones, or we could be feeling unsupported. People could seem insensitive or uncaring, or our own needs seem to be at odds with the needs of family and friends. What feels right clashes with logic today. What people are saying may be a misrepresentation of their true feelings/emotions. It’s better to think before we speak, or misunderstandings can follow. There may be the need to pause to adjust things before moving plans forward. We could feel at odds with others on an emotional level. Public relations are not as favorable now. There is a good ability to successfully combine logic and intuition, and to understand problems taking into account the human element. There is sensitivity to people’s issues now. Cooperation. Effective, sensitive decision making. This can be a good time for getting loans, for taking care of business, and for dealing with money matters. It’s also good for getting in touch with feelings and managing them effectively. There can be a boost to our intimate life, creative impulses, and self-understanding. Events occurring now might involve some kind of karmic repayment or benefit. We could discover new information, hidden information, or a lost item. This is a time for recycling – seeing new uses for old items. True feelings come to the surface. We are looking forward, happy and confident about making changes and improvements. We are willing to experiment and explore. This is not the best time for dealings with the public or promotions. Ideas or communications may not be going over well. There can be a need to look at things from a new perspective, and/or to change plans. Intense, magnetic, penetrating perception, power to confront. Can be destructive, vengeful, jealous, overly dramatic. Fire is enthusiastic, dynamic, and spontaneous, but lacks reflection. We are more courageous and adventurous now, with a tendency to act before thinking. There is little concern about what happened in the past. We are competitive and possibly impatient or bored easily. We may have a difficult time being objective or detached. We may not be especially communicative. Moon less than 45 degrees behind the Sun. Time to tie up loose ends, review, reflect, let go, and edit. Note that when an aspect is applying, it has not yet happened but is within orb – it’s pending. When an aspect is separating, it has already happened/perfected and is moving away from the aspect. Depending on the speed of the planet/body involved, the aspect will have perfected, or will perfect, in a matter of hours (often the case with the Moon), days, months, and possibly years in the case of the very slow-moving outer planets and bodies. Note that the Moon moves at a rate of approximately one degree every 2 hours, so that if an aspect involving is applying and has an orb of 5 degrees, the aspect will perfect (be exact) in about 10 hours. If the Moon is separating from an aspect with an orb of 2 degrees, it has already formed said aspect approximately 4 hours ago (since the following are positions at noon today, then it would have occurred at about 8 AM today). **I suggest paying close attention to applying aspects. The energy of the aspect builds as it gets closer to exact. Once an aspect involving inner planets has happened, it’s over. Separating aspects are good to know for context, but in terms of energy that is with us today, applying aspects are most important. 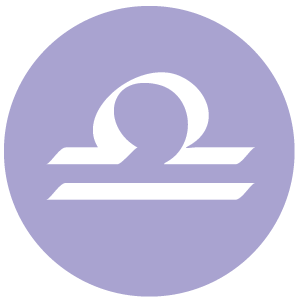 (This is the case for daily astrology influences involving inner planets, which pass quickly, and not natal astrology aspects, which are with us for a life time). You have an emotional intensity, and a strong need for drama. Under stress you will create drama and intensity in your life. You may have been born at a time when your mother experienced a crisis, or your birth may have been traumatic. Your mother may have been possessive and intense. This is a good time for feeling emotionally certain and motivated. We are more resourceful and insightful. The ability to keep the emotions on the inside today may be a strategy that turns out to be most successful. You are a sunny and adventurous individual. You are optimistic and philosophical, and may tend to bluntness. Sabian Symbol: An easter sunrise service. You have opportunities for adventure. You can be assertive when you make the effort. You have an overly optimistic and idealistic approach to life. You are prone to excessive behaviour and can be egotistical. Positively, you have the ability to reach your goals. You are responsible, serious and reliable. You may have had a stricter father than the other children. Work and a career will be important to you. You have the self discipline to succeed. You have difficulty shining in your life because of a childhood wound, perhaps connected with your father. You lack confidence and feel lonely at times. You have much empathy for other people’s suffering and may become a healer or counsellor. You seek knowledge to expand your world view. You are a born philosopher, enjoying any information which helps you see the big picture. For instance you may enjoy a religious debate. You place importance on freedom of speech and thought. Sabian Symbol: An old bridge over a beautiful stream. You have an intense need for relationships. You will also be intense once in a relationship. You will want to know your partner’s innermost thoughts and yet you may have a tendency to secrecy. Sabian Symbol: A massive, rocky shore. You are a sensitive and gentle partner. You are artistic and creative and enjoy sharing your talents with your loved ones. You have compassion and understanding for other people. You have a strong desire for diplomacy and justice, and a strong creative urge. You may become indecisive when opposed. Sabian Symbol: A boat landing washed away. You enjoy the excitement of conflict and challenge. You can be arrogant or charming and do well in selling. Be careful with dangerous sports as you can be accident prone. You feel intensely and need to be able to control your emotions or you may attract violence. Learn to back off and realise that others do not feel as intensely as you do. We might doubt the effectiveness of our efforts to go after what we want under this influence, which can lead to passive-aggressive behavior, defensiveness, or frustration. You have a strong desire to be of service, and high religious or spiritual ideals. You may also have an obsession with detailed perfection. Sabian Symbol: A royal coat of arms. This can be a time when we are hungry for meaning and understanding, but it can be difficult to align ourselves with a personal philosophy or belief system that truly reflects our core. We might be led astray by beliefs and ideas now, or we might experience some form of crisis of faith. Your current life challenge is to embrace adventure. You may find yourself in situations which inspire you to see the big picture. Inspiring others, possibly through preaching or teaching, may be part of your life’s destiny. Benevolent groups may also play a key role. Sabian Symbol: A mother with her children on stairs. Some feelings of disillusionment can come now as our dreams and ideals can be put to the test. Questioning our faith in our dreams can lead to lack of follow-through or wasteful activities and avoidance of responsibilities. Ideally, this crisis leads to a realignment of material goals and spiritual ideals as we assess what is truly meaningful to us. The urge to start fresh, to break free from restrictive attitudes or circumstances, to totally redesign an area of our lives (or even our personalities), and to gain freedom through independence is strong during this cycle. (May 27, 2010 to August 13, 2010, then March 11th, 2011 to May 15, 2018, then November 6, 2018 to March 6, 2019). Sabian Symbol: Two prim spinsters sitting together in silence. A time for making sweeping changes and for adapting to changes in order to progress. This is a time for revising, altering, overhauling, and purging. We can experience tension, fear, and pressure, but also a sense of liberation from over-attachments and situations that have been holding us back from growth. Sabian Symbol: A girl blowing a bugle. Tests of our boundaries; breaking down and rebuilding structures and rules. (From January 25, 2008 to June 14, 2008, then November 26, 2008 to March 23, 2023, then June 11, 2023 to January 20, 2024, then September 1, 2024 to November 19, 2024). You have the ability to be a catalyst in your daily life, helping others face and heal their emotional pain. Strong awareness of our own vulnerabilities and humanity stimulates compassion for others. (April 20 to July 20, 2010, then February 8, 2011 to April 17, 2018, then September 25, 2018 to February 18, 2019). Sabian Symbol: An easter promenade. This can be a time for grabbing the reins and working solo. There can be strong energy for new enterprises but not necessarily for routine work. Sabian Symbol: A woman has risen out of the ocean, a seal is embracing her. You possess wisdom and the ability to structure your thoughts. Your mind copes well with plans and you like to put things in their proper place. Sabian Symbol: An ancient bas-relief carved in granite. It’s especially important to us that our partnerships are fair and balanced during this cycle, and we can be particularly bothered if the scales are tipping. We feel stronger if we are able to maintain harmony, negotiate effectively, and treat one another fairly. Sabian Symbol: Three mounds of knowledge on a philosopher’s head. You feel cared for when others accept and encourage your sense of individuality. You feel comforted when surrounded by groups of people. You teach others to accept their eccentricities. Sabian Symbol: People on stairs graduated upwards. This is a quest to become dedicated to the service of others. You will need to overcome the tendency to daydream and feel overwhelmed and to put your compassion and wisdom to practical use for humanity. Sabian Symbol: A bald-headed man dominates gathering of national figures. Sabian Symbol: A fertile garden under the full moon. Sun 03° Taurus 58' 43"
Moon 06° Capricorn 17' 13"
Mercury 09° Aries 40' 05"
Venus 04° Aries 34' 29"
Mars 15° Gemini 54' 47"
Uranus 02° Taurus 36' 48"
Chiron 03° Aries 42' 34"